Lutzoni, F. et al. 2004. Assembling the fungal tree of life: progress, classification, and evolution of subcellular traits 1. American Journal of Botany 91(10): 1446–1480. Moore R.T. 1980. Taxonomic proposals for the classification of marine yeasts and other yeast-like fungi including the smuts. Botanica Marina 23: 361–73. Schoch, C.L. et al. 2014. Finding needles in haystacks: linking scientific names, reference specimens and molecular data for Fungi. Database. doi: 10.1093/database/bau061 Reference page. Humber R.A. 2012. Entomophthoromycota: a new phylum and reclassification for entomophthoroid fungi. Mycotaxon 120: 477–492. Spatafora, J.W., Chang, Y., Benny, G.L., Lazarus, K., Smith, M.E., Berbee, M.L., Bonito, G., Corradi, N., Grigoriev, I., Gryganskyi, A., James, T.Y., O’Donnell, K., Roberson, R.W., Taylor, T. N., Uehling, J., Vilgalys, R., White, M.W. & Stajich, J.E. 2016. A phylum-level phylogenetic classification of zygomycete fungi based on genome-scale data. Mycologia 108(5): 1028–46. doi: 10.3852/16-042 (PDF). Vizoso, M.T. & Quesada, C. 2015. Catalogue of type specimens of fungi and lichens deposited in the Herbarium of the University of Granada (Spain). Biodiversity Data Journal 3: e5204. doi: 10.3897/BDJ.3.e5204. Reference page. 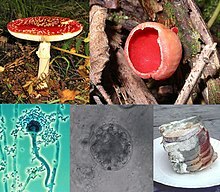 For more multimedia, look at Fungi on Wikimedia Commons. Апошняе змяненне старонкі адбылося 16:30, 18 красавіка 2019.